Many a time SPM Chemistry can be an absolutely interesting subject among the three science subjects namely Physics, Biology and of course, Chemistry. Unfortunately, students nowadays find Chemistry a daunting subject and thus, fail to even pass the examinations, not to mention the SPM examinations which are just around the corner. In line with the education outcomes outlined in the Malaysian Education Blueprint 2013-2025, here I have written several ways to score A+ in SPM Chemistry. Well, the rule of thumb is to understand and master each chapter. In Chemistry, a chapter is interconnected to one another. Therefore, if you cannot understand the first few chapters, which are mostly basic knowledge in Chemistry, you will then suffer in the following chapters. It is like you have a broken chain. In other words, you ought to start understanding the earlier chapters now if you have not mastered them. It will be a helpful way too if you can ask yourself a lot of questions which in turn develop your critical thinking skills. Chemistry is mostly about understanding. Chapters which require memorisation are only a few. It is, thus, a strict no-no for you to memorise Chemistry concepts. You can memorise the electrochemical series (ECS), the colours of salts, the names of the chemical processes, but not the rate of reaction, ionic and covalent bonds, just to name a few. If you have a hard time to understand them, immediately find someone who can lend you a helping hand! Doing exercises is particularly important to score A+ in Chemistry. Repeated exercises ensure that you truly understand a chapter. But, in my opinion, understanding comes before exercising. Only if you understand one chapter very well, then you may proceed to exercises. This makes quality learning process occur. Someone once said that Rome was not built in a day. The point I want to make is only continuous exercises will help you in Chemistry. Besides, choose the exercises which have contents adhere to the current syllabus for Form 4 and Form 5, and target those sitting for SPM examinations. It is no doubts that you can score an excellent result in SPM by doing past year questions. It is a fact too when it comes to scoring A+ in SPM Chemistry. Past year questions, not only shows you how the questions are set, have given you a view on how the answers are marked schematically and what the popular questions are. More often, your teacher will provide you past year questions to complete, but it will be great if it is provided topically. Such past year questions are already made available in bookstores (Analisis Bertopikal). You will have a much clearer idea on what will be tested. You can go that extra mile by going on certain websites and with their multimedia-rich contents, you can download and do trial papers too, if time allows. In an effort to score A+ in SPM Chemistry, I can guarantee that your chemistry will improve by leaps and bounds. Bear in mind that you will only reap what you sow. Good luck! Lucas Ting is a form 5 leaver who scored straight A's in SPM 2013 and is eager to share his learning method with everyone else out there. Now, he has completed his pre-tertiary education at Kolej Matrikulasi Labuan. 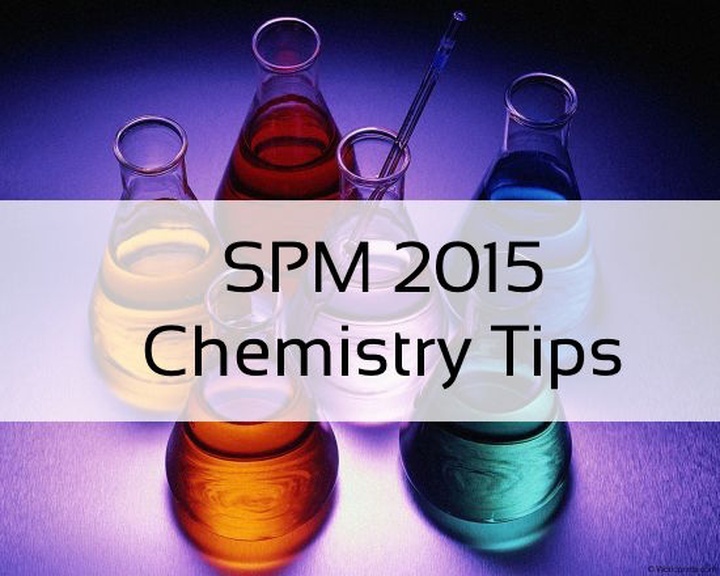 SPM 2015 Tips: How to Study Chemistry, Biology & Physics? Great post. Chemistry needs understanding and everything will be at your fingertips. Hi!Im going to sit for my SPM exam for next year. I get only 6A's in my final year exam.I didn't get good results in all my science subjects even though I worked harder compare to other subjects.Can u plz give me some tips on how to study smartly for biology,chemistry n physics subjects so that I can get excellent results in my upcoming exams n also tips to manage my time properly to avoid stress.